Disciple: According to Einstein there is no gravitation. That is to say, there is no force of attraction exerted between objects, He says that what we call gravitation is due to curvature of space. Sri Aurobindo: What is all that? Disciple: He says that Euclidian geometry is not applicable to the material world. That is to say, space is not flat, a three-dimensional analogue of a two-dimensional flat surface. Euclidian figures like the square and solid and straight line are abstract, not real or actual. He also says that material space is “boundless but not infinite”. Sri Aurobindo: How do you know? Perhaps it is not space that is limited but our capacity to measure space that is limited. Besides, how can you say that space is limited to Matter? There is non-material space beyond this material universe. A being can leave behind our material space. Disciple: Einstein began his contribution by proving that simultaneity of events, constancy of mass and length etc. are all relative and not absolute. If the same length is measured from a body moving with great velocity at a distance the length would change. Besides, he showed that in a system of reference if the whole frame of reference moves uniformly than no measurement within the system can give you the proof of the uniform motion. He has also shown that time is an indispensable factor in the measurement of dimension of an object. 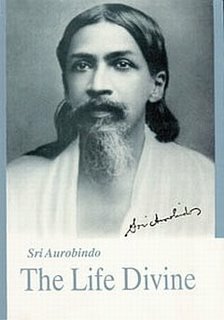 Sri Aurobindo: Time is not an indispensable factor of dimension. Movement is absolutely necessary to feel time. When an object is stationary the consideration of time does not enter in measuring the dimension unless you move it to some other point. Really speaking, one has to know space as the extension of being and time as an extension of energy. Sri Aurobindo: But the taps do not change the dimension of the board! Only, you can say that a consideration of time is necessary to complete your measurements of space. Disciple: Einstein has introduced a fourth dimension of time, in addition to length, breath, and height; their combination he calls the time-space continuum. It can be conceived as a cylinder over which a spiral is wound. Sri Aurobindo: It is only a phrase! Time cannot be relegated to the position of a mere dimension of space, it is independent in its nature; Time and space may be called the fundamental dual dimension of the Brahman. Disciple: Ouspensky has an idea in his Tertium Organum that our three-dimensional world is a projection from a subtler fourth –dimension which is suprasensual but real. He means to say that to each solid form we see here there corresponds a subtler from of it which is in the fourth dimension. Sri Aurobindo: That is perfectly true, the cube would not be held together and therefore would not be a solid if something in the subtle dimension did not maintain it. Only, it is not visible to the physical eye but can be seen with the subtle eye. Disciple: Sir Arthur Eddington in his Gifford Lectures (1934) says that science began with the aim of reducing the complexity of the material world to a great simplicity. But now, it seems, science has not been able to keep its promise and no model of the material universe is possible. A good deal of mathematics and specialization is necessary now to understand what science says about the material world. Eddington says that the table on which he is writing is not merely a piece of wood. Scientifically speaking, it is a conglomeration of electrical particles, called Electrons, moving at a very great velocity, and even though the particles are moving, his hands can rest on the surface and not go through. So also a ‘ripple’ in water is not meant only to give man the knowledge of the pressure of the air, and the force of surface-tension. Sri Aurobindo: Validity of human knowledge is not dependent of physical science alone. Physical science is only one side of knowledge. The poet’s and the mystic’s and the artist’s experience have equal validity. Disciple: Eddington argues that even in so-called objective scientific knowledge it is mind that is asked to judge ultimately: 8 x 4 is 32 and not 23.Why? Sri Aurobindo: It is by an intuition and repetition of experience and not merely by reason that man finds that one is right and the other wrong. Now even the scientists have been forced to admit that their conclusions are not all based on reason. Their formulas have become like magic formulas. Disciple: They say that they can demonstrate their conclusions. Sri Aurobindo: Yes, demonstration to the mind again.